This is probably one of the most popular use of diamond hole saws. If you have ever been involved in any kind of bathroom – kitchen renovation, this will sound very familiar. Regular drill bits do not work on tiles. So, you need diamond coated bits. The smaller sizes such as 1/4″ are used for screw holes. 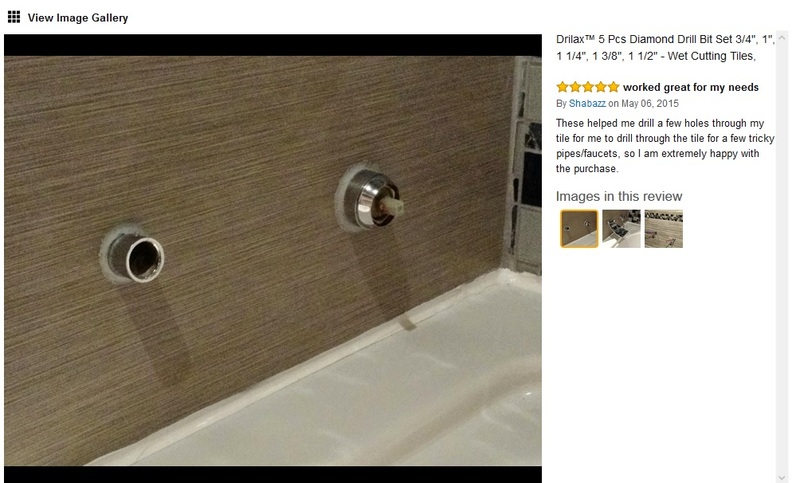 The holes that you use for installing grab bars, towel holders, soap dispensers, etc. The mid sized hole saws such as 1 3/8″ are used for pipe holes or faucet outlets. Without these diamond hole saws, contractors used to break tiles and try to make grooves for pipes and faucets. You can achieve very handsomely clean holes without the mess and hassle of wasted tiles. What is the Recommended Drilling Speed? Please see our post on this topic. This is an example of a small water pool around the hole. 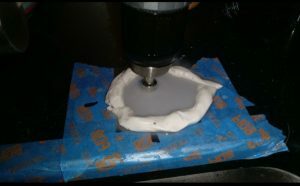 You can use play dough or plumber’s putty to keep water around the diamond hole saw. 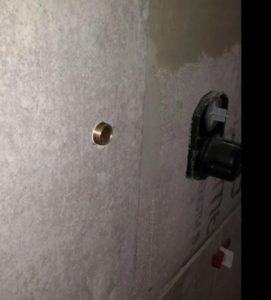 The picture above was posted by one of our customers, and this was his first time ever drilling tiles. There are also some shower heads that need much larger diamond hole saws. There is a great 5 star review on Amazon. 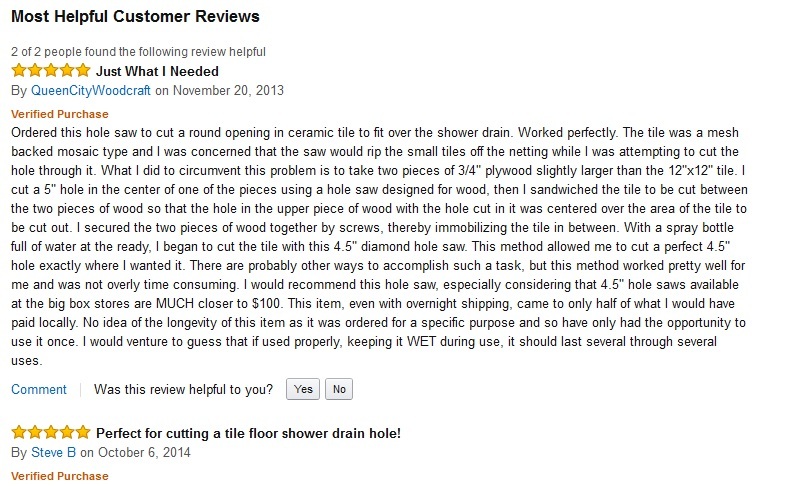 He purchased this large size 4 1/2″ hole saw for rain shower installation. Looking for a core drill which can be used to bore a 1/2″ OD x 1/4″ ID path without a centering hole, minimum of carbide tipped possibly PCD, needs to be 1.385″ long with 1/4-20 threads 1/2″ deep on the non-cutting end and a 0.125″ ID hole thru at 0.75″ down from the non-cutting end, overall length is 1.585″, no flutes on the tube ID or OD. 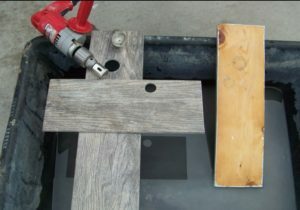 Where can I buy Drilax hole saw guide in CANADA? If you use ebay, we have a distributor that ships to Canada from USA. I am having to drill a small hole into a piece of VERTICLE Porcelin tile. Does anyone know how to keep water on the diamond bit continually other than spraying with a hand sprayer and water. Should I drill slowly or fast ? If you can not bring water to the drill bit, you will have to bring the drill bit to the water. Start slow, dip the tip of the drill bit in water every 10 seconds, make sure it cools of. We recommend using the DRILAX drill guide to get the hole started.